This is from an article written by Peter Edwards of the Southern England Kite Group. We now have a thriving population in the Chilterns that is rapidly colonising the Home Counties without our help. All they need is our continuing protection from persecution and adequate food. Concerns were raised that feeding kites might slow down colonisation outside of the Chiltern area and that feeding inappropriate food may affect the health of birds, especially chicks. As a result there was a meeting of experts from Natural England, RSPB, London Zoological Society, Welsh Kite Trust, South of England Kite Group and the Chiltern Conservation Board and it was agreed that there was no evidence for this. In fact it was agreed that feeding the kites was clearly beneficial. As a precaution feeding guidelines were revised listing inappropriate foods like cooked meat that may be deficient in calcium that is needed for growing bones. Uncooked meat containing skin and bone is best. During 2007 there was a reduction in feeding by the public in response to publicity about these concerns. 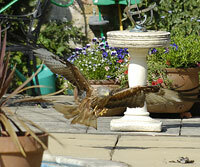 This coincided with the poorest year on record for red kites breeding in the Chilterns. Since the beginning of the release project Chiltern birds were the most productive, fledging on average 2 chicks/nest, more chicks fledging per nest each year than anywhere else in the country. Since 2007 the Chilterns was almost the lowest fledging on average 1.6 chicks/nest. This may represent the combination of the high density of kites breeding in Chilterns and competition for food. We have also observed that brood sizes remain higher on the edge of their range where densities are lower, but growing and the range extending. Feeding kites is likely to maintain their populations at higher densities and increase their rate of spread, but is probably no longer necessary for the successful establishment of the population in the UK. Feeding kites is one of the factors that has been instrumental in the successful establishment of the population in the UK. Now the population is established, feeding is probably unnecessary and is increasingly causing problems through birds being conditioned to taking food while losing their fear of humans. It should also be remembered that these magnificent birds are opportunists and will quickly recognise new sources of food, especially in the summer when they have chicks to feed. There have been issues with kites taking food from barbecues, pub gardens and playgrounds. 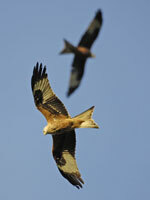 As a result the Southern England Red Kite Group discourages the feeding of kites in the Chilterns. In particular, we discourage the provision of large amounts of food as this is likely to cause issues with neighbours and lead to very high concentrations of kites.